WISER is pleased to welcome visiting faculty members and simulation leadership from Duy Tan University, Da Nang, Vietnam. Seven visiting faculty members are participating in WISER�s two month Preceptor Program as part of a long-term agreement with WISER. Included are faculty from the School of Medicine, School of Nursing, and School of Pharmacy. 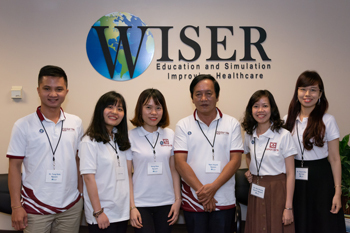 WISER will be working closely with Duy Tan University on the creation, integration, and implantation of simulation programs throughout various schools within the University.